Sidebed or stand alone crib. Rent this cosleeper sidebed crib to keep baby at your bedside at night. Suitable from birth till 6 months (9 kgs maximum). Delivered with matress protection and cotton fitted sheet. You're travelling to France with infant? Or you already leave in Paris with baby? 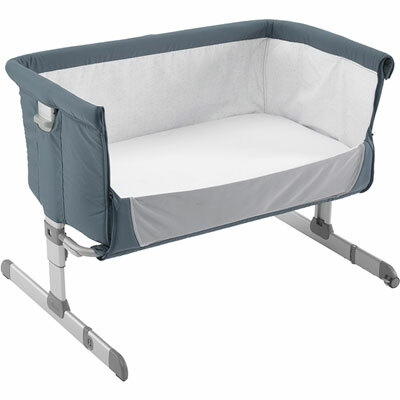 baby'tems recommands this co-sleeper bassinet: easy to attach to parents bed, easy to use as sidebed or stand alone crib, rounded and soft shapes, removable and washable lining for a perfect cleanliness, you will enjoy having baby in this crib. It is also easy to assemble, allowing you to take it with you when travelling in France. As all our baby gear in Paris, we do deliver to your place on appointment. Long term rental available in Paris and surroundings. Andrea from Spain (infant crib, bouncer and pram): ¡Muy recomendable! Los productos prácticos y en perfecto estado. El servicio eficaz y amable. La perfecta ayuda para el viaje con tu bebé.